Classroom Portable PA that will easily fill a whole class. The PA Combo was designed to be robust and sturdy while providing clear, loud amplification for classrooms. It is ideal for voice amplification in a teaching environment, for assemblies and for playback of various sources. This is a great classroom PA system that will give you great value for many years. Use a wired microphone to amplify your voice for announcements, assemblies and presentations. Optional Variable Speed CD, USB & SD Card to speed up or slow down playback - great for dance and PE. Connect and amplify your iPod or any Media, MP3 player or Laptop. Easy to transport, easy to set up and use by anyone, anywhere. Voice amplification in a teaching environment, or use it as a PA sound system in classrooms, in assemblies and for playback of audio for exams. Use the rechargeable battery version outside for sports days or sports coaching. Excellent meeting room amplifier for reinforcing presenters' voice and amplify most audio sources. Present a slide show and talk over the sound track. You will be clearly heard without raising your voice. Use the remote control functions of the CD player version to give better control and flexibility of use. Choose the CD drive option to slow down the audio from CD/ USB/SD. You can amplify most devices: laptops, tablets, smartphones. Please note: the 44583 has replaced the 2070 model. 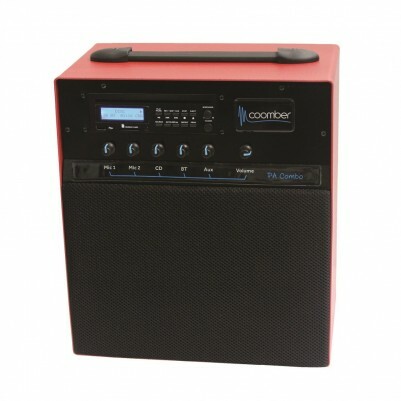 The 2070 Coomber Portable Amplifier has been discontinued. Wherever you need to have clear loud amplification of your voice, music or speech this unit gives you simple control reliably every time you need to depend it. It is used as a PA sound system for classrooms, in assemblies and for playback of audio for exams, it can be used outside for sports days or sports coaching. The CD and MP3 files stored on a USB Memory Stick or SD card can be slowed down for learning dance steps or speeded up for a more intense workout in PE. The line input will amplify any external audio device with a suitable output such as iPods, iPads, tablets, laptops and smartphones which makes it a great solution if you are looking for a classroom amplifier. The 44583 is a versatile unit able to fill a whole class. You can use it for both voice reinforcement (PA, assemblies) and sound amplification (Dance, P.E. ).